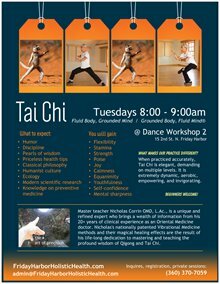 New Tai Chi class, new location! The class time is 8:00am – 9:00am every Tuesday. The building dates from the 1800s and has the original flooring, lots of light, great mirrors, and tons of atmosphere. This is not your typical Tai Chi class. It is challenging and develops very strong roots, balance and inner strength. It is taught the authentic way with precise body alignment and flow of inner energies. It is also humorous and light-hearted! No matter what your starting level, whether an experienced practitioner or a complete beginner, you are always welcome, and will soon progress in multiple ways. Consistency, curiosity and open-mindedness are the 3 golden keys to your progress in this amazing art called Tai Chi.